It is a fact that all the great Anglo-Saxon writers who have written about Spain whether it be Gerald Brenan, Laurie Lee,George Orwell, Jan Morris or VS Pritchett all found Spain a land of contrasts. And who I am to disagree? Many of you will know that that Easter in Spain is called “Pascua” and is more often referred to as “Semana Santa” which means Holy Week. 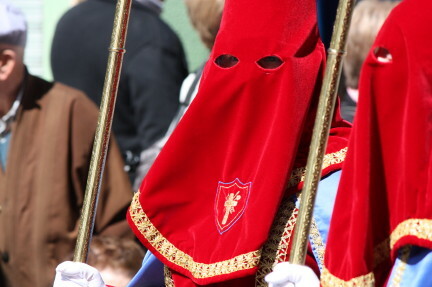 Although in modern Spain most people do not go to church on a regular basis, studies show that most still “believe” in Christianity and it is this type of distant creedence and profound tradition that keeps the customs of ”Semana Santa” very much alive. To give you a few examples I know people who don’t go to church yet the daily menu in their house in this religious week is based pretty much on what Spaniards would have traditionally eaten fifty years ago in order to comply with the church rules of Lent.e.g. On Tuesday “Arroz de Verduras” (Vegetable rice) made from artichokes,broad beans,green garlic and red peppers. An amazingly tasty dish. Wednesday sardines followed by “hervido”,vegetable stew for lunch. “Ensalada de alubias”(potato and bean stew) on Thursday and “Potaje de garbanzos”(chick pea and spinach stew) on Friday. No meat. This in a family of non churchgoers! This is still common in many families,whilst in others it is a thing of the past. What surprises me most is that the food even though it is meant to be frugal is in fact excellent and of course,healthy. This slightly eccentric centuries old Lent diet is contrasted by the array of sweets, amazing pastries and chocolate consumed in this week. Depending on where you are in Spain the traditional sweets and pastries vary but the abundance contrasts with the traditional lent fasting. Over the years I have spent many Easter holidays in Cehegin in the mountainous north-west of Murcia relatively near the Granada-Murcia provincial border.The traditions here include the solemn music and processions, whilst up the road in the mountain village of Moratalla they have frenzied drum beating with a fair amount of eating and drinking in between to keep the up the energy levels as on Good Fiday they play all day long. They even have bars set up in the street in a kind of fiesta type atmosphere. The last time I went on Good Friday solemness was not on the menu. However when I first experienced solemn processions in other towns I was impressed by how seriously they were taken and by the atmosphere of torchlit, narrow streets lined by “Nazarenos”(hooded penitents) and ladies dressed in black and with the typical “mantillas”(laced shrouds).Combined with mournful music the effect, even after many years, is slightly morbid, and with the “Nazarenos”, hooded and anonymous, even slightly sinister. All this set in the old part of town through dark,tortuous and steep streets giving the feeling of being in another age. I had never seen anything quite like it. Of course, this was designed for effect by the church in the old days to contrast nicely with the knees up and “hood’s off” celebration of the resurrection on Easter Sunday. However, I have also seen a different face of the fiesta in ” Las Turbas” in Cuenca which is often referred to as “La Procesion de los Borrachos”(The Procession of the Drunkards). I am not sure if the procession is the same as it was as I went some 30 years ago but I believe so. I went there as I had heard of this ‘different’ interpretation of a Holy Week procession and sure enough, after hours of fiesta on Thursday night a large and inebriated crowd surged round the cathedral door at about 4.30am. After a few false starts the figure appeared on the shoulders of eager helpers at around 5.30am, coming out of the door at various angles. There was a formal group of people (Los Turbos) to carry the figure, but there was also a big crush of overboisterous and very drunk people trying to touch/carry the platformed figure. I thought the stories I had been told were some kind of exaggeration but I followed the figure at a distance of ten metres and watched its progress as it swayed dangerously from one side to the other through the medieval streets of Cuenca and at least on a couple of occasions it nearly fell to the ground. A curiously distinctive fiesta! (And a word of warning if you ever go to Cuenca be careful with the local brew, resoli…pretty lethal). The contrast between this procession and others is clear. This kind of twist to the celebrations is a reflection of how different cities/regions celebrate this spring religious fiesta in their own way. Each one having its own uniqueness. 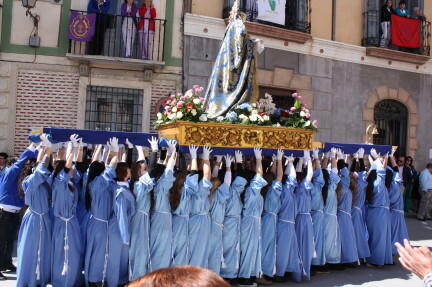 Cofradia de laVirgen del Primer Dolor,Cehegin…..Figure of the Virgin lifted up in a moment of ‘dancing’ by all female team,Cehegin. More than anything the Spanish use “Semana Santa” to get away from the cities, their normal routine and get out into the countryside. A vast amount of people go camping or to a B+B “Casa Rural” to take outdoor advantage of the sunshine of the spring weather(or lament the heavy April showers). Flowers, good weather and a feeling of spring abound. In Valencia kiteflying and eating the Mona(sweet bread) are the norm. Every year on the news as millions of holidaymakers travel to and from their destinations the newsreaders morbidly and constantly report the death tally on the roads and how the spring rains ruin a processions somewhere in the south, But these things are , of course part and parcel of life and nothing deters this annual migration to the “pueblo”(hometown),to the campsite or to see the traditional processions in Andalucia. Easter, in Spain,is a time for optimism, reflection,centuries old traditions(albeit contrasting ones),travel, and family gatherings. 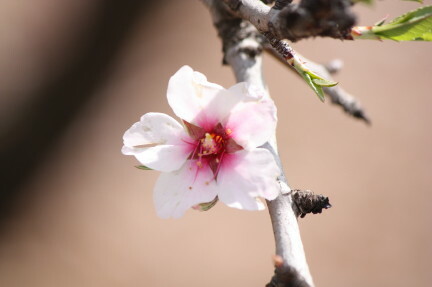 Even in these dark days of crisis the sunshine of Easter and its longstanding traditions make it a spring fiesta that welcomes the new season and the prospect of the summer to come with optimism. And without doubt it is one of the best Spanish fiestas to experience as it has so many formats and customs depending on what part of Spain you are in. Drums : Calanda, Hellin, Moratalla. 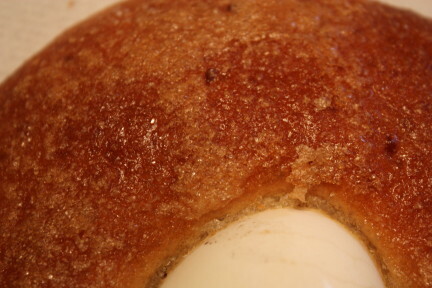 This entry was posted in Cehegin, Cultural holidays, customs, Fiestas, Holy Week, mediterranean food, Murcia, Semana Santa and tagged cakes, cultural holidays, Customs, Easter in Spain, family gatherings, Fiestas, Food, holy week, mediterranean gastronomy, pascua, processions, semana santa, sweets, Traditions, Travel by Paddy Waller. Bookmark the permalink. We’ve just had a crazy Semana Santa in Sevill, Tarifa and Granada. Predictably unpredictable, exhausting, wonderful. I read your post and sounded as if you had fun..Alot in just a few days!but a great time of year.